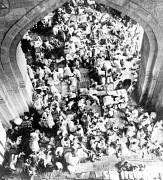 People sitting in the entrance of a mosque, c. 1940. Man holding the Baretta pistol which killed Mahatma Gandhi (still from movie “Five Hours to Rama”?). The Baretta pistol that killed Mahatma Gandhi. Four rifles with knives on front. Rifles with knives on front. A shadow on a wal showing a rifle. Drawing of a knife pricking a hand. Bow and an arrow that killed a bird. Three lines of barbed wire. Mushroom cloud at a distance and a ship with officer in front.